My shipping address and billing address are not the same. 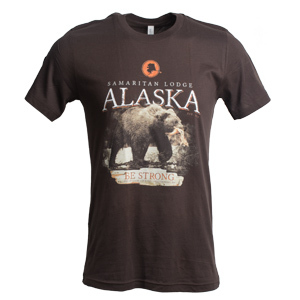 “Be strong and of good courage” from Deuteronomy 31:6 is the message of this brown T-shirt. It features an Alaskan brown bear, much like those that our Operation Heal Our Patriots couples might see during their time at Samaritan Lodge Alaska for Biblically based marriage enrichment.